"freely you receive, freely you give"
In this tutorial we will build a simple Spring MVC 3 application with AJAX capabilities using DWR. We will explore how to convert a simple Spring service bean into a DWR service and access it from a JSP page. We will be developing a non-AJAX application first then convert it to an AJAX-powered version later. Ajax is a group of interrelated web development methods used on the client-side to create interactive web applications. With Ajax, web applications can retrieve data from the server asynchronously in the background without interfering with the display and behavior of the existing page. Data is usually retrieved using the XMLHttpRequest object. Despite the name, the use of XML is not needed, and the requests need not be asynchronous. Notice nothing much is different, except that the non-AJAX version will display the result on another page, while the AJAX version will display on the same page. Actually, this is the main difference! With AJAX we have a responsive, desktop-like application. No page refresh. Let's develop first our non-AJAX Spring MVC application. // This service is the same service that DWR uses! The first mapping receives a request to display the add page. The second mapping receives two numbers and delegates the computation to the ArithmeticService. When the ArithmeticService is done processing, the controller then forwards the result to another JSP page which displays the result. Let's run the application. We'll be adding two numbers: 5 and 10, and we expect 10 as the result. * @RemoteMethod exposes this method to DWR. * Your Spring beans can still access this method. This is a very simple POJO service that contains a simple arithmetic function. To make this POJO available as a Spring service bean, we just add the @Service annotation. Notice we've also annotated the class with @RemoteProxy. This enables the same POJO to be utilized by DWR! 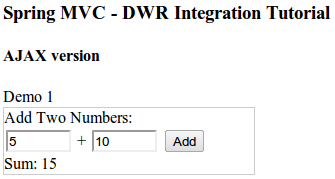 This means to integrate DWR in our existing application, we don't need to duplicate existing code. Let us now convert our non-AJAX application to an AJAX-powered version. We have already enabled our existing ArithmeticService to be utilized by DWR. That means we just need to create our JSP pages to display the AJAX version of our application. Actually we just need to create one JSP page because both the request and result will be shown on the same page! This is the primary benefit of AJAX. We also need another controller to handle the page request for the AJAX version of our application. Here is the JSP page. The success callback function retrieves the result named data. Then we used DWR' utility class again to update an HTML's value with the result. Let's run our application and check the result. The result is displayed on the same page. There's no need to create another page just to view the result. We're almost done with our tutorial. Now we need to add the required XML configuration to enable both Spring MVC and DWR. Take note of the URL patterns. We've separated the URL patterns for pure Spring MVC and DWR calls. In the web.xml we declared a servlet-name spring. By convention, we must declare a spring-servlet.xml as well. By convention, we must declare an applicationContext.xml as well. Note that, with Spring 3.0, this tag works in Servlet MVC only! <!-- Without the following adapter, we'll get a "Does your handler implement a supported interface like Controller?" We've referenced a separate config file dwr-context.xml that contains DWR-related beans. @RemoteMethod annotations and register Creator proxies for them. <!-- DWR will map util.js and engine.js files to the dwrController. The best way to learn further is to try the actual application. You can download the project as a Maven build. Look for the spring-mvc-dwr.zip in the Download sections. You can run the project directly using an embedded server via Maven. The problem with the original Maven project is it uses the latest DWR 3.0.RC1, but it is not available in the Maven repository. So I had to add it manually under the WEB-INF/lib folder. The project works when it's deployed via Eclipse's m2 (Maven) plugin. However, when it's deployed via the standalone Maven, it complains that some DWR classes are missing. There are a couple of workarounds like adding the library to your local repository. See here: http://stackoverflow.com/questions/2479046/maven-how-to-add-additional-libs-not-available-in-repo. But this would require the user to setup a repo and makes the project not portable. If you want to learn more about Spring MVC and integration with other technologies, feel free to read my other tutorials in the Tutorials section. 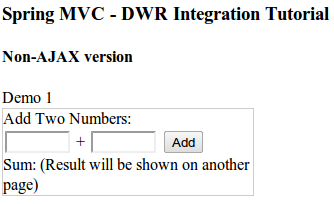 What are the advantages/disadvantages of using DWR vs Spring MVC 3.0 built-in AJAX support (@RequestBody and automatic Model to JSON conversion)? Could you please check in the code in 'Google Code' ? The repository is empty. The code does not seem to run on Jetty or Tomcat, at least not the code attached in the ZIP-file. @Frode, the project exists in the Google repository. I've updated the Maven project that fixes the issue with the DWR not loading. Could you tell me please how can I fix the following problem? org.springframework.beans.factory.parsing.BeanDefinitionParsingException: Configuration problem: Cannot locate BeanDefinitionParser for element [annotation-scan]"
and the app is not available. It works with the embedded mvn tomcat:run though. Do you have any suggestions? Thanks! hey really your tutorials are very helpful in implementing each and every point in the project.... I have used almost all your tutorial for creating new spring project... Thanks a lot. Is there a way to post you my technical problems apart from your tutorial? If there pls suggest. @Anonymous, feel free to post your issues here. I would suggest posting the issues related to the tutorial or the topic. @Anonymous, you have to post the full error stack. I am unable to post my full error stack. is there any other option to do it. Can u give me solution for this error ? unable to print a collection of data on jsp page. please help. Thanks a lot for this post. Great work! What would be the modifications need to be done in this project if we want to use Reverse Ajax? Thanks. had the same error as anonymous. I'm having the same problem. Does this error been solved? Someone kindly post the solution. I found an article on how to solve this error. Basically, you need to download DWR-3.0.0-rc-SNAPSHOT. If you're using Maven, you need to put it in your pom.xml. 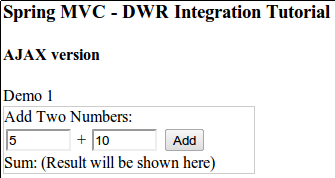 This one was nice article to learn more on the integration of spring mvc with dwr.. I hope this can also be applied to Spring Portlet MVC too. I have one query here. We have some custom tags in jsp. We need to display data with custom tag in the jsp. Can you please let me out if you have already come across this issue. I read everywhere that common logging is needed to use DWR. We have logback logging, would that be a problem? Thanks! how do you know the js file will be there as I dont see any config in the xml file that says that when u refer to../interface/.. there will be a a dwrService.js file ? hi your code working fine, but am trying to integrate same thing to example which is shown in this link http://howtodoinjava.com/2013/03/21/spring-3-and-hibernate-integration-tutorial-with-example/ if possible please can u guide me ???? it is not supporting. rather than bvalue dinamic like above, if it is static like bvalue="true" then its working fine... can u please help me out to solve this???? Why are you non-ajax jsp code is the same (nonajax-add-page.jsp & nonajax-add-result-page.jsp)? Have you ever faced CSRF Security Error while integrating spring and dwr. I am getting the above error on page load and the dwr invocation calls Error Handler method. I'm a Java and Spring developer who enjoys learning and sharing. Freely you receive, freely you give.